Yeah... I feel bad for Nanoha, she lost to Fate with the gap of the votes being almost double. 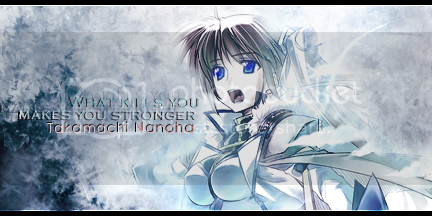 T.T Nanoha lost to Fate-Chan....Well, still congradulations! One more closer to winning! Sad for Nanoha, but I had to vote for Fate-chan. Nanoha vs. Tsukasa and Fate vs. Kagami. How can you do that to poor Nanoha? Time to support Nanoha and Fate again! Nanoha and Fate need your support again. Some tough matches today, so every vote counts~!